Good news today, the new manuscript of Sophie Lardy has been accepted for publication in Animal Behaviour! Congratulations to Sophie! Although long neglected, female competition is widespread and may have stronger evolutionary consequences than previously thought. In singular breeders, reproductive success is conditional on social status, and intrasexual competition for the dominant position can be particularly severe in females. Because the ability of females to secure the dominant position may strongly influence their fitness, a better understanding of the determinants of dominance maintenance is needed. Using a 21-year data set on Alpine marmots, Marmota marmota, we investigated the potential drivers of female dominance loss in a singularly breeding mammal. Particularly, we tested whether the dominant females’ ability to retain their social position depended on the number and the characteristics (age, relatedness to dominant individuals) of potential competitors in the social unit. To identify the potential underlying mechanism, we further investigated how the number of subordinate females affected females’ competitive ability. We found that the risk of losing the dominant position increased with the number of subordinate adult females in the group, but that the age of the subordinate females and their parentage relationships to the dominant individuals were unlikely to be driving dominance loss in this species. Moreover, when the number of potential competitors in the social unit increased, we observed a difference in body mass increase between the dominant and her subordinates leading to a decrease in the body mass difference between dominant females and their subordinate adult females, and ultimately to a higher risk of females losing the dominant position. Overall, our results showed that the number of potential competitors in a social group affects the females’ ability to secure their dominant position, and suggested that this effect is mediated through changes in female body mass. 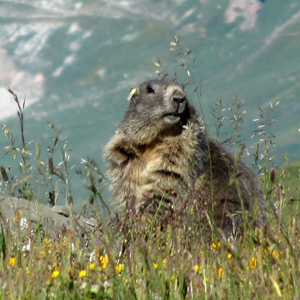 We are a research project focusing on the Alpine Marmot run out of the University of Lyon. This entry was posted on November 22, 2013 by marmotmarmota in article.